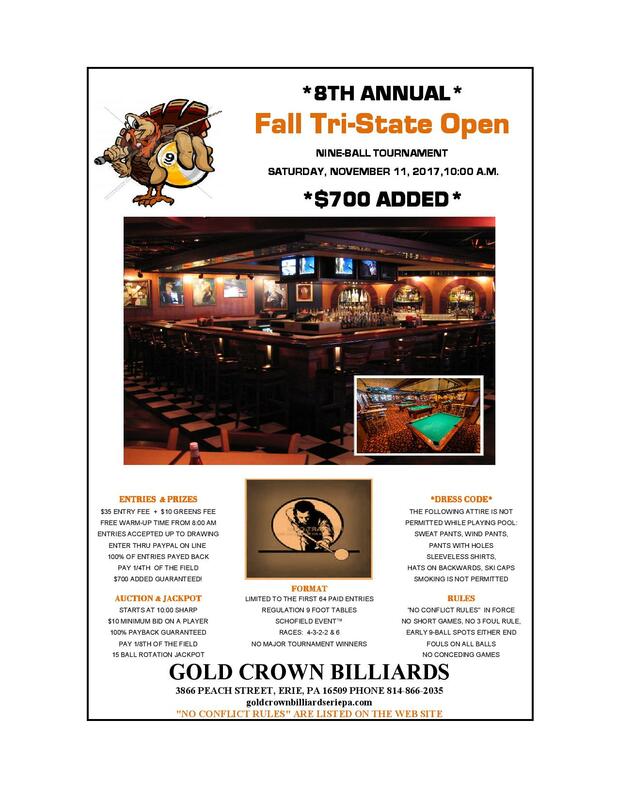 The Tri-State series of quarterly Nine-Ball tournaments continues with event #32 scheduled for Saturday, November 11th at 10:00 A.M. This is the Eighth Fall Tournament. The entry fee is $35 plus a $10 greens fee. The format will be a SCHOFIELD EVENT™ which includes quadruple elimination qualifying rounds and a single elimination championship round. 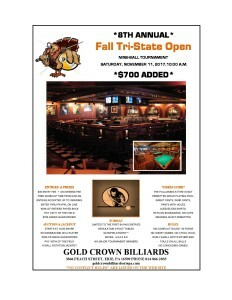 In addition, there will be a 15 ball break and run jackpot. Tickets will be sold all day long for $5 / 3 for $10. As always, there will be an ever popular and successful calcutta followed by a 2nd calcutta during intermission. The field is limited to the first 64 paid entries. If you are planning on attending, get your entry in well in advance. Enties will be accepted online through PayPal. This event generally fills at least a week prior to the tournament.